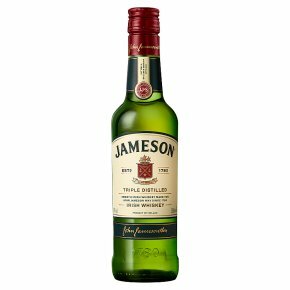 Jameson Irish whiskey is a triple-distilled blended Irish whiskey, as versatile as it is smooth. Whiskey like Jameson isn't just born smooth and balanced. First, we take the best of pot still and fine grain whiskeys. Then we triple distil them. Not because we have to, because we want to - this gives Jameson its signature smoothness. This tradition began in 1780 with John Jameson, and we continue his legacy to this day. Finally, we age our whiskey in oak casks for a minimum of 4 years. The result? A unique whiskey with a perfect balance of spicy, nutty and vanilla notes with hints of sweet sherry. Serving suggestion: Jameson, Ginger & Lime - A simple whiskey drink, it's a thirst quencher that couldn't be easier to make: 50ml of Jameson Irish Whiskey, ginger ale to taste and a wedge of lime. Mix in a highball glass, give the lime a squeeze and drop it into the glass.